I was looking at all the discontinued products in the skincare section at Priceline when I stumbled across the Natio Spa Detoxifying Clay Face and Body Mask. I was at first hesitant because I have tried my fair share of clay/mud masks such as Formula 10.0.6 which has been not so great for my sensitive skin. What drew me in was the price, $7.50 for 210ml of product...BARGAIN! I LOVE THIS PRODUCT! 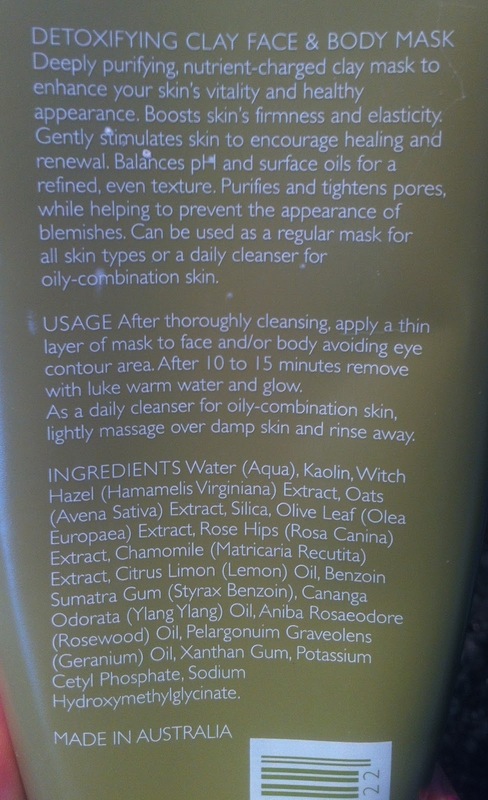 I didn't notice it when I purchased it but it could also be used as a face wash for people with oily/combination skin. For people like me who are impatient this is a great product. you get almost the exact same benefits as a mask if you use it as a face wash and leave it on for 1 minute. You feel the effects instantly after you rinse the product. All the excess oils are drawn out of the skin and all the impurities are lifted (so I recommend using pore strips right after). This is by far the best clay/mud mask I have used. The only problem is that it is discontinued in Priceline so I'll have to find it somewhere else. I have seen them in Natio gift sets before so I'll probably purchase it from there. As you can see above on the right it has a great combination of ingredients. Skin type- Oily/combination skin, sensitive skin, acne prone skin.